Competing at the top national or even international levels. Our vast experience in Show Jumping, supported by great success, including many wins at international level with yard horses and ponies all over Europe, qualifies us to help you get to the very top and to stay there. Generally at this level all lessons are private or are part of group master classes run by visiting professionals. Our Group and Master Class training and Coaching events are run by highly respected and professional instructors, both local and international. Sessions have a focus and can be individual or run in small groups. Most of practical sessions but we also run occasion theory courses and sessions. 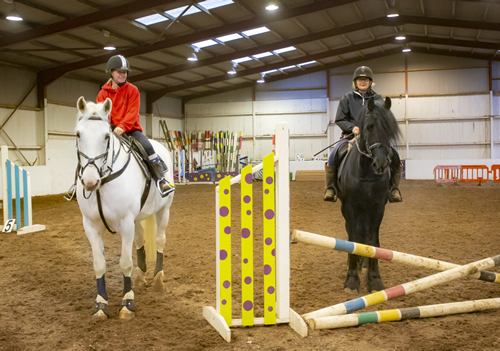 Our focus in on Show Jumping but we regularly run session of other disciplines such as Dressage and Eventing - many courses an apply to different disciplines so we have plenty for all. Keep en eye on our calendar page and face book for these sessions and booking information to ensure you do not miss that perfect opportunity for you and your horse.